The Generation II Wireless Digital Radiography system weighs 6.5 pounds and is designed to go 10 hours on a single charge, manufacturer Vetel says. Veterinarians who travel from office to farm to stable looking after their equine patients carry all the equipment they can along with a wish list of items they would add if the opportunity arises. Kenneth Marcella, DVM, of KLM Equine Services in Canton, Ga., has just about everything he wants, minus one piece of equipment that’s yet to be invented. Dr. Marcella owns digital X-ray equipment, ultrasound for reproduction uses, ultrasound for tendons, a tomography camera and a Lameness Locator. He also has the standard stuff, such as power floats and equipment to treat problem hooves. He fits it all into his Chevrolet 2500 extended cab pickup with Porta-Vet box. “There’s not a whole lot of stuff out there, equipment-wise, that we don’t have,” Marcella said. Marcella said he would own a shockwave sound therapy unit, but because other equine veterinarians operate in his rural area, he and the other practitioners agreed not to duplicate equipment that isn’t used regularly. They want to ensure that someone’s expensive equipment doesn’t sit underutilized. Another equine veterinarian has a platelet rich plasma machine, and the other practitioners refer patients to the doctors who have what’s needed to do the job. What's the one piece of equipment he wishes he had? Marcella wants a mobile MRI. But they don’t exist—yet. He spoke with researchers at Massachusetts Institute of Technology who are working on it. They have created a machine that bombards inert gas with lasers, and the machine looks for how the laser reflects off molecules. It’s similar to technology scientists use for looking for subatomic particles. If their research yields an MRI unit that fits in the back of a truck, Marcella said he’ll be the first in line to get it. 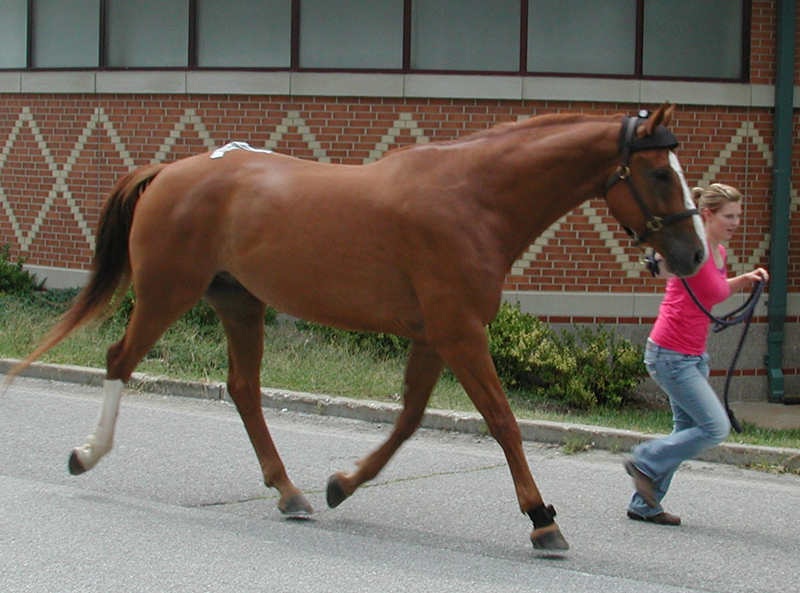 A veterinarian takes a horse for a trot with the Lameness Locator by Equinosis equipped to test its mobility. Essential Equipment Marcella has a Lameness Locator, a relatively new real-time handheld computer by Equinosis that enables practitioners to use non-invasive sensors to identify lameness in horses. The unit reportedly is piquing the interest of an increasing number of veterinary practices. “I plan on acquiring a Lameness Locator as soon as possible,” said Mark R. Baus, DVM, owner of Grand Prix Equine in Hawleyville, Conn.
Dr. Baus recently made a two-for-one addition to his staff size and equipment count. “I hired an associate veterinarian earlier this year and she has a DR system, an ultrasound machine and a power float,” Baus said. Joanne Ruisi, DVM, owner of Hassayampa Veterinary Services in Wickenburg, Ariz., which also offers mobile services, recently added a second-generation digital X-ray system. Dr. Ruisi also has an ultrasound machine, and at her physical clinic she has a full in-house laboratory. She opened for business in July 2012 and said she’d like to add a scope and upgrade some monitoring equipment as finances permit. Ruisi is often torn between her clinic and mobile services. She operates in a rural area, so getting to patients takes longer and adds to vehicle wear and tear. Digital radiography and a wireless, battery-powered X-ray generator. Diagnostic ultrasound for reproductive and musculoskeletal exams. Inertial motion sensing device (Lameness Locator). Basic surgical instruments and biopsy tools. Laptop PC for practice management software and diagnostic image review. Dr. Waldsmith believes that foremost among the equipment, most mobile veterinarians don’t have, but should have, a gastroscope. “It seems that gastric ulcer concerns are on the rise and a positive diagnosis will improve owner compliance with treatment recommendations,” Waldsmith said. He’s also noticed that many mobile veterinarians don’t have a shockwave, something he believes is essential. 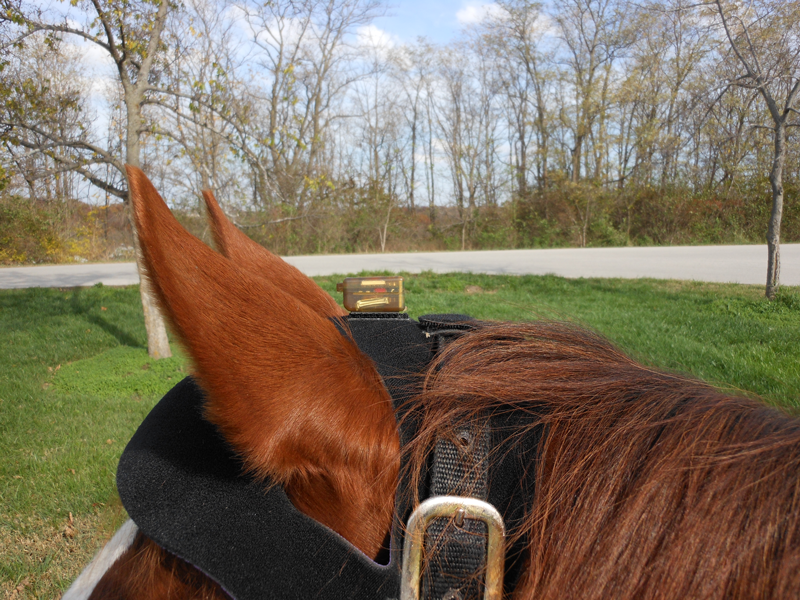 Custom Head Bumper: Head bumpers are normal items placed on horses' heads to protect them in low-ceiling environments, such as horse trailers. This head bumper one is configured to attach the head sensor for the Lameness Locator. Vetel has exclusive distribution rights in North America for the Lameness Locator. “The new Generation 3 shockwave devices are very efficacious and much more economical to own compared to previous versions,” he said. “The clinical results are consistently positive when used on properly diagnosed cases and conditions.” John Small, president of BioVision Veterinary Endoscopy LLC, had no qualms suggesting as a key piece of equipment his company’s NeedleView Arthroscope, an 18-gauge needle that enables scoping without the need for general anesthesia. “If you’re going to diagnose lameness, whether it be in a dog or a horse, we think our equipment will be the standard of care moving forward,” Small said. 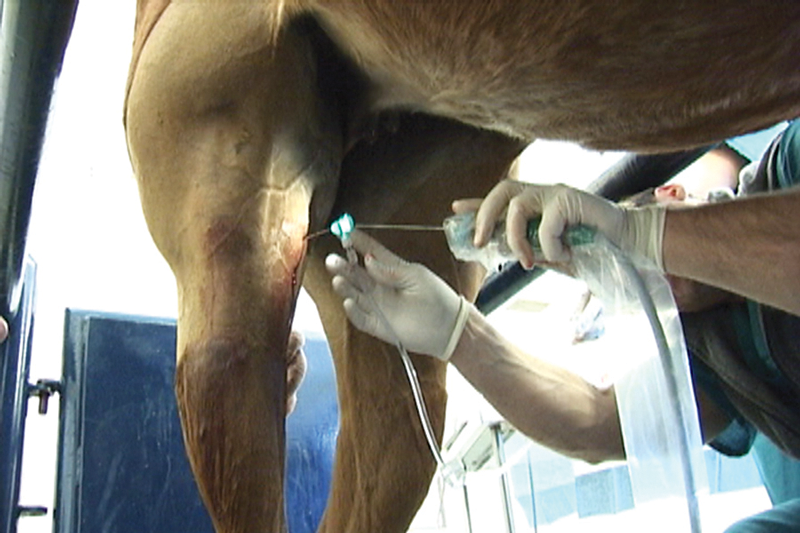 Small said the arthroscope is particularly valuable for horses believed to have a stifle joint problem. Being able to offer more services using better equipment means a mobile veterinarian can remain competitive, Small said. 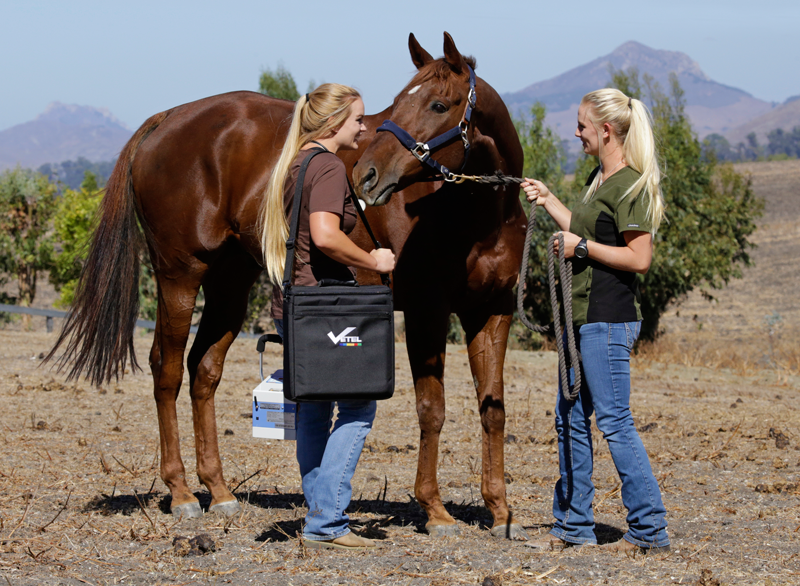 Mobile veterinarians just starting out have a host of equipment to consider, but Waldsmith advised taking advantage of startup programs offered by drug distributors. On capital equipment purchases, he advised exploring lease options that offer seasonal payments—for example, higher in the summer and lower in winter for a practice that is anticipated to be slower during winter months. Other tips Waldsmith offered include hiring an accountant, looking at long-term costs of product ownership, trying out credit card payment devices that can be tied to a cellphone and offering an online pharmacy. David Frisbie, DVM, PhD, Dipl. ACVS, performing an arthroscopic standing stifle procedure using a Biovision Veterinary Endoscopy LLC. 's NeedleView product. When Baus was starting off as a mobile equine veterinarian, he didn’t wish so much for equipment as he did for a bit more business acumen. Marcella advised those starting off in a mobile practice to suppress any notion of taking a slow, cautious approach to stocking up on necessities. “Buy the best quality equipment you can get,” he said. Marcella believes that veterinarians who have all they need at their disposal will do more, and those who don’t have essential equipment won’t be able to offer certain services. Veterinarians with all the needed equipment can do a better job, better serve their patients and be more profitable, he said. With the availability of low-interest loans and the offers from equipment manufacturers, mobile veterinarians nowadays may be fully outfitted for about $150,000, Marcella said. “A lot of these companies selling this equipment are giving you three or four months, no payment,” Marcella said. But making a successful run at operating a mobile practice requires more than being fully equipped, Marcella said. Marcella, whose practice consists of mostly sport horses, said he often works till 7 p.m. or later, especially during show season. “My day ends up at between 7 and 9 on a regular basis,” he added.